Red Dead Redemption 2 has set a high bar for the next generation of open world games, and as much as we’ve already discussed it, we’ll be addressing the deeper themes of the story as we continue to work through the game. However, there are a few points that I got hung up on in the game, and would love to advise you on the best way to avoid those mistakes yourself. So without any further ado, here are a few tips and tricks to help you make decisions in the Wild West. Unlike Red Dead Redemption or Grand Auto V, money is relatively easy to come by in RDR2. Story missions and side missions often result in sizable fiscal rewards for Arthur, although some story missions do require upfront investments and sometimes result in a bounty on Arthur’s head. That said, there’s no reason to live frugally. Use your money to upgrade your horse or your guns as a priority, and then feel free to go shopping at the tailor or play a few rounds of high-stakes poker. For the most part, selling wares will also net you a good amount. The easiest way to cushion the game’s already generous income is to loot as much as you can stand it. Bad guys often have pocket watches, belt buckles, or even jewelry on them that can be sold for a pretty penny. If shootouts go down near or inside buildings, search those buildings for provisions, cash and other valuable items. Offload these items at a local Fence to keep plenty of space in your satchel and generate some extra dough. And don’t pass up bounty hunting. It’s easy cash. Eagle Eye and Dead Eye are blessings. There is no obvious time limit to Eagle Eye use, so there’s no reason not to use it constantly while hunting or searching for herbs, plants, etc. Paired with some Scent Blocking Lotion and bait, you’re sure to see success in your hunting endeavors. Dead Eye does have a time limit, but there’s no shortage of tonics or provisions that can replenish your Dead Eye core in a jam. So use it. It makes shootouts far more manageable, but it also makes them way more fun. I particularly enjoy using R1 to mark several targets in a single go. Dead Eye also helps immensely with hunting. Hunting has been prioritized in RDR2. There are legendary animals across the map that can be skinned to craft some of the best clothes and items in the game, which are not available for purchase without the pelt. Perfect pelts can also be used to craft badass clothing. But it’s not entirely obvious how to obtain a perfect pelt in the game. There are a number of factors that play into obtaining a perfect pelt. The first is the size of the animal. This will determine which weapon and ammunition you should use. The second is the quality of the animal. You can press R1 to study the animal, which will also display its condition: poor, good, or pristine. Only pristine animals will result in a perfect pelt. Large animals like bears and elk require a rifle, preferably with high velocity or split point ammo, whereas it’s nearly impossible to yield a perfect pelt on a small critter without using the Varmint Rifle. Midrange animals like foxes and beavers require a Repeater or bow and arrow with improved arrows. This guide proved incredibly helpful for me. Also important: even a pristine animal hunted with the right weapon can drop from perfect pelt to good pelt if you shoot it more than once. Use Dead Eye to locate the vulnerable parts of the animal and deliver a fatal blow. You can take these pelts to Pearson at camp to craft cosmetic upgrades to the furniture, but it’s probably best to prioritize taking perfect and legendary pelts to the trapper where you can craft clothes, saddles, etc. It’s worth noting that you must first sell the pelts to the trapper before you can purchase the items he crafts with them. RDR2’s is very different from Red Dead Redemption’s in one core way: John Marsten was a lone wolf, whereas Arthur Morgan is very much a player in an ensemble cast. That doesn’t mean you can’t fly solo and head to another part of the map for a few game days. 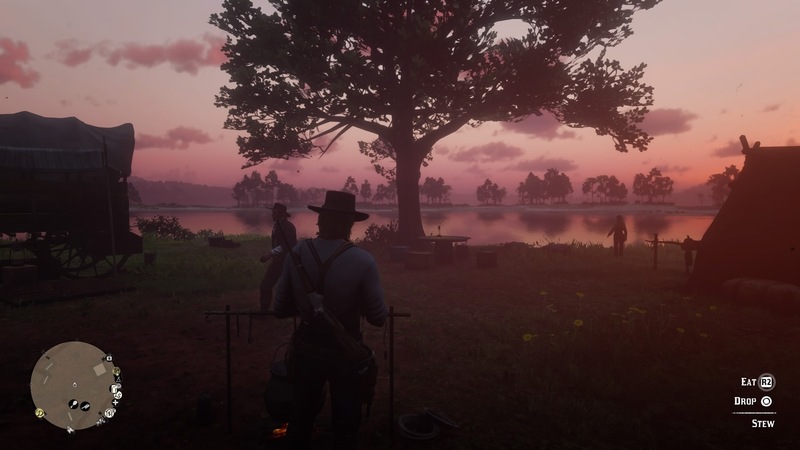 But many of the story missions involve other members of the Dutch Van Der Linde gang, and home base for Arthur is the gang’s camp, where many of those characters are hanging around. Because of this shift, RDR2 introduces the idea of camp donations. You can donate money, food, or items that can be sold for camp funds. These donations are more or less useless. They are money or food that you won’t see again. However, alongside the box for donations is a ledger that allows you to check out how the rest of the gang is donating and also make purchases to upgrade the camp. Provisions, ammunition, medicine, and lodging are all upgrades worth purchasing, in my opinion. Upgrading them ensures that the best food and ammunition are simply sitting around camp. It’s a way to turn camp into a convenience store carrying most of the equipment you’d otherwise need to purchase by bopping around a town. Upgrading lodging unlocks the fast travel map, which becomes more and more necessary as the map opens up. Given that there are usually missions that originate from camp, I visit it often as a way to reset. I donate anything of lesser value to camp to clear out space in my satchel, restock on provisions, tonics, and ammo, and help myself to a free bowl of stew to replenish my health cores. Camp also features a poker table, which happens to be one of my favorite pastimes in this game. Just assume that if you’re doing a Dutch story mission, you’ll end up with a bounty on your head. Sometimes these are cheap, and sometimes the bounty is upwards of $100. The game more than makes up for the money it asks from you, doling it out in myriad ways, but dealing with a bounty in a bigger city or town can make side missions and other tasks incredibly annoying. If you’re not into constant shootouts and running from the police, do your side missions and mundane errands in a town before firing up the Story Mission.